God desires for us to pour out our hearts to Him, whether in joy or pain. But many of us don't feel right expressing our anger, frustration, and sadness in prayer. From Job to David to Christ, men and women of the Bible understood the importance of pouring one's heart out to the Father. Examine their stories and expand your definition of worship.Also available: A Sacred Sorrow Experience Guide (9781576836682, sold separately), to help individuals or small groups get the most out of this book. Expand your definition of worship. It's easy to praise God when things in your life are going well, but what about the other times? What happens when mountaintop experiences cascade into seasons of struggling in the valley? God desires for us to pour out our hearts to Him, whether in joy or pain. But many of us don't feel right expressing our anger, frustration, and sadness in prayer. Our personal worship experience is not complete unless we understand the lost language of lament. 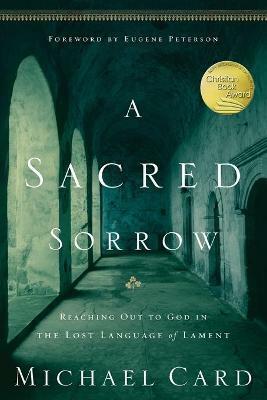 In A Sacred Sorrow, author, musician, and Bible teacher Michael Card takes you through the Scriptures to show you what your worship and prayer life has been missing. Learn new ways to honor God and deepen your relationship with Him by: -Becoming more honest in worship -Trusting in His unchanging presence -Believing in His constant loving-kindness -Realizing that the sharing of your sorrow is an act of worship From Job to David to Christ, men and women of the Bible understood the importance of pouring one's heart out to the Father. Examine their stories and expand your definition of worship. Let your pain, questions, and sorrow resound with praise to a God who is moved by your tears. MICHAEL CARD is an award-winning musician, performing artist, and songwriter. His many songs include "El Shaddai" and "Immanuel." He has also written numerous books, including A Violent Grace, The Parable of Joy, and A Fragile Stone. A graduate of Western Kentucky University with a bachelor's and a master's degree in biblical studies, Card is currently at work on a Ph.D. in classical literature. Michael lives in Tennessee with his wife and four children.